12.5" RCOS @ ~f/9 (2880 mm fl) at 1.28 arcsec / pixel. Zoomify image scale is 1.65 to 2.203 arcsec / pixel. 11/1/2009 to 11/15/2009 Chino Valley, AZ... with CCDAutoPilot3 & CCDSoft. eXcalibrator for (b-v) color calibration, using 7 stars from the NOMAD1 database. CCDStack to calibrate, register, normalize, data reject, combine sub exposures & color combine for the LRGB. North is to the bottom, I think it looks better up side down. 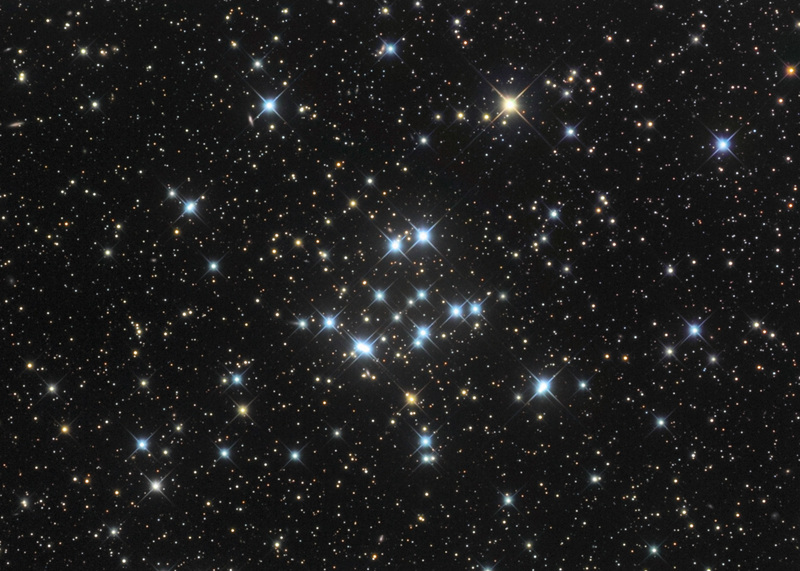 M34 is an open cluster, with about 100 stars, in the constellation Perseus. At a distance of 1,400 light, years its apparent size is slightly larger than the full Moon. The age of the cluster is about 180 million years. M34's discovery is attributed Giovanni Batista Hodierna, sometime before 1654, and independently discovered later by Charles Messier on August 25, 1764.